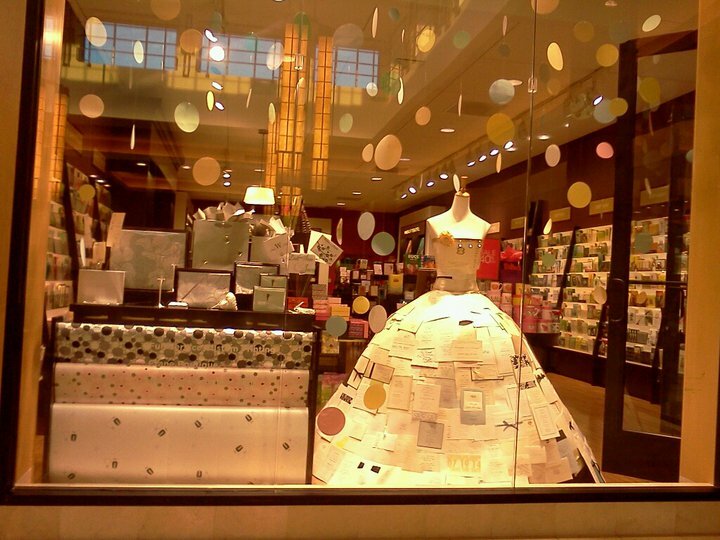 back in february, all 4 dallas stores had the opportunity to make wedding dresses out of wedding invitations. we were sent torsos and instructions on what dress to make, but each of us took our own routes. i made a strapless princess ball gown. a couple came in to the store one day and were in awe of my dress. jill and jay were their names. sweet couple. jill said she wanted to do something similar for the singles group at her church, so we exchanged business cards to keep in touch. unfortunately, i was so tied down with work for the next few months that i failed miserably to keep in touch, but she would pop in every once in a while to let me know that she still wanted to do a paper dress. my ball gown did not last throughout the summer because a kid fell on it and the waist dropped, so i had to make a more simple design. later on, in october, jill popped in again and had confirmed that they were going to do a paper dress for the singles group at their church. we chatted for a bit to throw out ideas and suggestions, as the singles group was going to have a dinner event in early november and they needed to get crackin’ on it. i felt terrible because i wasn’t able to offer much help after that day and the event came and passed by the time jill popped back into the store about a week or two later. 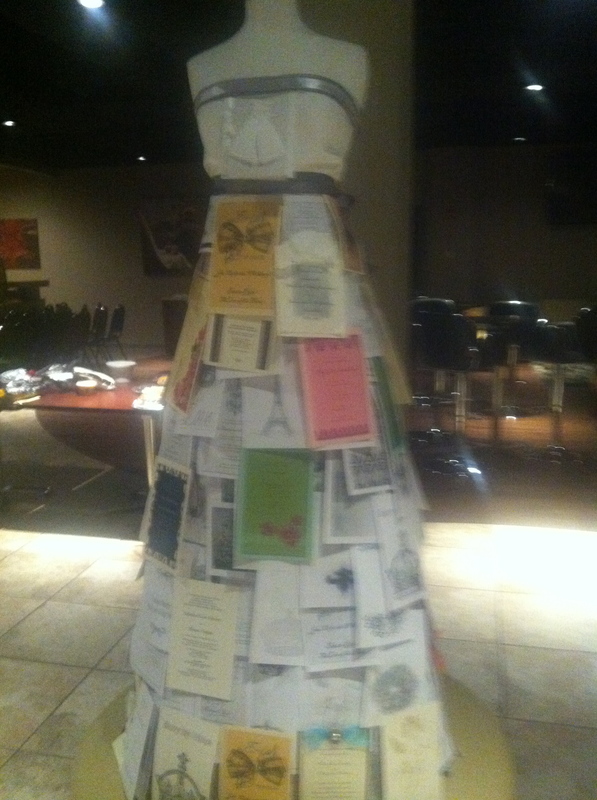 BUT SHE TOOK PICTURES OF THEIR PAPER DRESS!!!!!!!!!!!!!!! and it’s gorgeous! 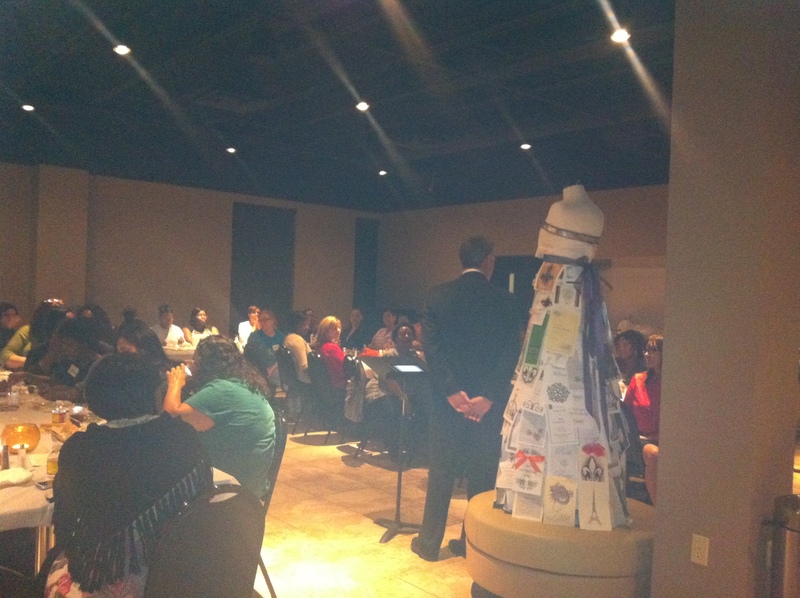 the single ladies made faux wedding invitations and letters to their future husbands and pasted them onto a torso and everyone loved the idea and the dress turned out to be a big hit! i was thrilled. and i was ecstatic that jill sent me pictures!!!!! the first picture is of the dress, which i thought looked AMAZING, the second picture was taken while the dinner event was going on, and the third picture is of the lovely couple that got inspired by my wedding dress back in february. 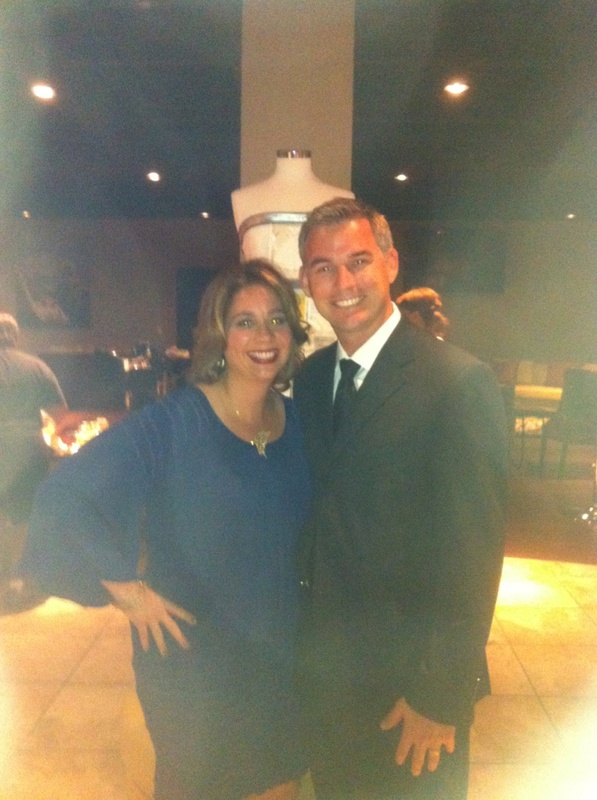 thank you, jill, for sharing your pictures with me and for having fun making the beautiful dress with your ladies! 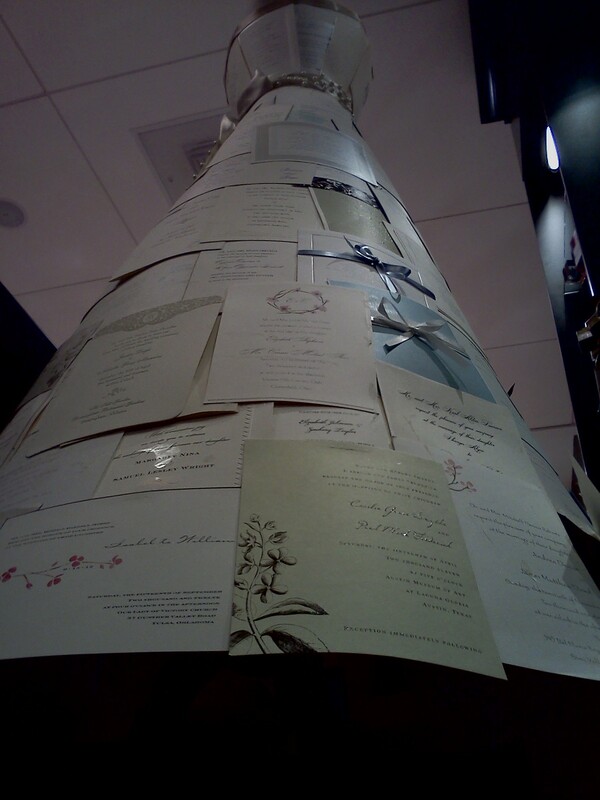 This entry was posted in crafts, paper dress, papyrus. Bookmark the permalink. Love the paper dresses! The one in the store window – stunning. Have a lovely day! the first dress looks pretty amazing. reading through your blog may answer this.. but i’m curious to know what kind of job you do.. is there a name for it? haha! i am a custom printing specialist (i work with brides doing their wedding invitations or businessmen doing business cards…basically, anything that can be customized on paper), a gift professional gift wrapper (i posted a “how to gift wrap” blog here), a visual merchandiser (i threw this in because of the window display projects i do-haha! ), and everything in between, as in the retail job of a retail store. i’ve always been a crafty person and a writer, so this job fits me perfectly! you are a real artist! nice to meet you. So much fun! Now I have ideas churning in my head. I don’t know if I will be able to bring them to fruition but it’s fun to think about.